It’s not often that new hospital programs are envisioned by a physician’s mom, but it happened in the geriatric emergency department at St. Joseph’s Regional Medical Center in Paterson, N.J. Hospitals are adapting certain departments and service lines to meet the needs of aging patients. 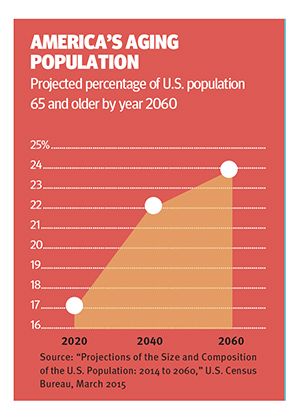 The 65 and older population is expected to grow from 46.3 million in 2014 to 98.2 million in 2060 — a 112 percent jump. 15.3 percent of people 65 and older had one or more hospital stays in the past year — a figure that rose to 22.4 percent for people 85 and older, according to 2013 figures. 21.3 percent of people 65 and older visited an emergency department in the past year, according to 2013 figures. 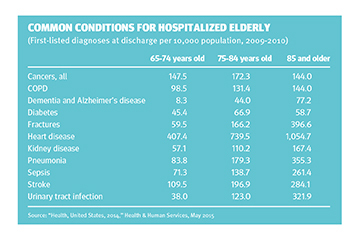 People 65 and older made 22.5 million visits to hospital outpatient departments in 2011. 19.7 percent of people 65 to 74 and 27.6 percent of people 75 and older reported that they were in fair or poor health in 2013. So Rosenberg met with his mother, two aunts and friends from her bridge group to talk about what they’d like to see in a senior emergency department. It took a few years of planning before he was ready to bring the concept to the hospital’s CEO and a few more years after that to bring the idea to fruition. Finally, in April 2009, St. Joseph’s opened the first iteration of its geriatric ED. The 11-bed space was located on the hospital’s third floor and featured natural lighting on three sides. It provided a quieter, less chaotic environment than a typical adult ED. Patient satisfaction went up, while return visits and admissions went down. “Overall we considered it very, very successful,” Rosenberg says. In its attention to senior patients’ specific needs, St. Joseph’s was on the leading edge of a growing trend. The burgeoning senior population, the shift toward outpatient care and payment for value, and changes in Medicare reimbursements are sparking innovations in geriatric care at many hospitals, says Donna J. Cameron, managing director of health care strategic solutions at Navigant Consulting Inc. “Hospitals that are serving an older population and that have a lot of Medicare patients are really starting to think about how to challenge themselves to provide programs and services that are oriented toward that population,” she says. In addition to geriatric EDs, the innovations encompass hospital-at-home programs, senior-oriented service line adaptations and wellness programs, Cameron says. Although these offerings require an investment, they may help hospitals to avoid taking hits from Medicare for readmissions and preventable complications. They also can be seen as a business opportunity as the baby boom generation ages. Based on the success of its initial geriatric ED, St Joseph’s relocated it downstairs in 2012, next to the adult emergency department. The move enabled the hospital to expand the unit to 24 beds. The environment remains calm, aided by harpists and aromatherapy, and still boasts features that meet seniors’ needs, such as thicker mattresses to guard against pressure ulcers. Most importantly, the actual delivery of care has been adapted. The unit doesn’t conduct traditional patient triage. Because it’s based on minimal patient assessment, it often fails to pick up the underlying problems that older patients have. “You can’t judge a senior the same way as you would a 35-year-old,” Rosenberg says. Most patients come to the geriatric ED for unscheduled urgent care and usually arrive during daylight hours. At St. Joseph’s. senior ED patients are put into a bed almost immediately. The typical time between a senior patient’s arrival and when he or she is seen by a doctor is 14 minutes, Rosenberg says. All the nurses are trained in geriatric illnesses and comorbidities. Beyond physicians, the care team includes a geriatric nurse navigator, a social worker, and physical therapists and pharmacists when needed. All senior ED patients are screened for several geriatric conditions — dementia, delirium, dietary problems, depression and risk for falls. A patient identified as vulnerable to any of those conditions receives a thorough workup and appropriate referrals. Patients’ medications are reviewed to identify any negative drug interactions. Emergency physicians use the American Geriatrics Society’s Beers Criteria, which lists potentially inappropriate medications for older adults. The unit also has a dangerous-drugs protocol for medications such as insulin or Coumadin. Elderly patients discharged from the ED are instructed not to take these types of medication until they get a call from a nurse in the morning. “It’s so critical to not only give patients written instructions, but to actually talk to them at the time they’re taking their medication,” Rosenberg says. He gives the example of an elderly patient whose Coumadin dose was cut from 4 mg to 2 mg. The patient misunderstood and was ready to take two of her 4 mg pills — a potentially deadly double dose — when the nurse on the phone stopped her, explained the dose change and walked her through cutting her 4 mg pill in half. “The bottom line is the patient did extremely well and disaster was averted,” Rosenberg says. Nurse care managers call patients discharged from the geriatric ED the next day, then on Day 3 and Day 7 to check their status and to make sure they went to their next place of care, whether it’s their primary care doctor or a specialist. One of the geriatric ED’s goals to is avoid admissions whenever appropriate. “It’s not for any financial reason, but very specifically because seniors often don’t do well when admitted to the hospital,” Rosenberg says. Research shows that among the risks faced by hospitalized seniors are worsening functional status, delirium, falls, medication toxicity, infections and pressure ulcers. Since the geriatric ED launched, the percentage of its patients who are admitted has fallen from 54 percent to 34 percent, Rosenberg says. Avoiding hospitalization for low-complexity patients frees up beds for high-complexity patients who need them the most. It also cuts costs for coverage plans, patients and the health system as a whole. The unit meshes well with the Triple Aim of health reform, Rosenberg says. Patients get high-quality care and a better experience than they would get in a regular adult ED. Plus, the health care screenings are a population health initiative, he notes. The geriatric ED also positions the hospital well for value-based purchasing and bundled payment initiatives by improving care and holding down costs, Rosenberg says. To give elderly patients an alternative to admission, some hospitals are beginning to offer hospital-level services at home. In this emerging model, the idea is to improve the patient experience, avoid the dangers of hospitalization for the elderly and lower costs, Cameron says. Mount Sinai Hospital in New York City launched a program to provide patients with acute care at home in December 2014. Typically patients are handed off to the hospital-at-home team from the emergency department or are referred by their primary care physician, says Albert Siu, M.D., professor and system chair for geriatrics and palliative medicine at Mount Sinai’s Icahn School of Medicine. The home acute care team includes a physician, nurses who make home visits and a social worker. The team brings in physical therapists as needed. The hospital provides or has arrangements with community providers for services such as pharmacy, durable medical equipment and lab work. Given that the team is providing acute care, the ability to execute rapid turnaround for these services at home is essential, Siu says. He illustrates the approach with a hypothetical elderly patient with pneumonia. Once it’s determined that care at home is appropriate, the patient would be sent home with IV antibiotics, get nursing visits at least once a day, but probably more often, and be visited by the physician daily. The team is available to the patient 24/7. As of October 2015, the team had taken care of 60 patients, Siu says. Patients stay at home in the acute hospital phase on average for four days. They receive some follow-up services for up to 30 days. Siu believes patients have had fewer complications than they would have had if they were hospitalized, are generally more satisfied with their care, and have low readmission rates. Patients are assigned a nurse they can call, and that nurse phones them. Patients come back to the ED for reassessment after two days. “It avoids admission, it avoids the expense of observation, and patients are happy,” Rosenberg says. To improve the quality and experience of care for senior inpatients, some hospitals are bringing geriatric expertise to particular service lines, depending on their populations’ needs. Thomas Jefferson University Hospital in Philadelphia provides geriatric medical consultation across the hospital and has specific programs for geriatric oncology and psychiatry. Jefferson’s senior adult oncology service, part of the system’s Sidney Kimmel Cancer Center, works with older adults and their treating oncologists to create a comprehensive, individualized treatment plan. The program features a full assessment, often completed in a day, by an interdisciplinary team that includes geriatricians, oncologists, dietitians, pharmacists and social workers. The geriatrician screens patients for other conditions that could affect cancer care, such as cardiovascular or kidney disease, dementia, depression and malnutrition. “We focus a lot on functional status because it helps oncologists in their decision-making,” says Susan M. Parks, M.D., director of the division of geriatric medicine and palliative care. To help seniors with serious behavioral health needs, Jefferson has a 12-bed inpatient unit staffed by geriatric psychiatrists. Soft, warm wall colors are intended to calm patients, while wide, tiled floors make movement safer for elderly patients with wheelchairs or walkers. Patients typically are admitted to the inpatient unit for a worsening of their psychiatric conditions, which are often age-related, Parks says. Common conditions include dementia, depression and anxiety. Because senior patients often have other medical needs, a geriatric consult team assists with medical issues on virtually all of the behavioral health unit’s patients. The team consists of an attending physician, a geriatrician and a geriatrics fellow. The 20-bed unit is managed by the system’s West Pines Behavioral Health, a psychiatric facility on the same campus, but it is housed in the medical center. Its acute care location means the unit can admit sicker patients because they can be transferred quickly to a higher level of medical care if their physical conditions deteriorate. Lutheran also launched a senior surgery program in 2013. With a growing senior population and an already successful geriatric ED, the medical center was looking for other opportunities to differentiate its care and improve seniors’ hospital experience. Elderly patients are identified during pre-registration so the operating room staff are prepared and know to use protocols for senior patients. Pre-op patient education is delivered in a way that aims to allay senior patients’ fears. In addition to carefully explaining what the patient can expect, doctors and staff sit with the patient when talking during pre-op and are more likely to give them a comforting touch on the hand or arm. Because elderly patients’ skin often is fragile and prone to bed sores, staff use extra cushioning while positioning patients to protect vulnerable areas. Heated air is circulated through elderly patients’ gowns to keep them warm. Other amenities include soft room lighting, reading glasses, magnifiers and pocket talkers, small units that amplify sound and reduce background noise for people with hearing impairment. Health reform and Medicare payment changes have spurred some hospitals to offer services outside the traditional inpatient and emergency realms. More hospitals are forming partnerships with fitness centers and YMCAs to offer wellness and exercise programs for the elderly, she notes. Other hospitals provide such programs in their own wellness centers. Mount Sinai Hospital houses its outpatient geriatrics practice and senior wellness services in its Martha Stewart Center for Living, which opened in 2007. The hospital’s Phyllis and Lee Coffey Geriatrics Practice takes a team-based approach to care in which physicians, nurse practitioners, social workers and care coordinators work together. “The thrust is to keep people out of the hospital to the extent that we can,” Siu says. The practice, a patient-centered medical home, uses its electronic health record to identify patients at risk for falls or with depressive symptoms so that the care team can intervene. The practice serves about 1,500 patients with an average age of 80. The center offers activities, classes and programs designed to help older adults get active and stay well. Included in its offerings are mindfulness-based stress reduction, tai chi and nutrition programs. The tai chi program was introduced because of its potential to prevent falls, Siu says. Mount Sinai is involved in a broader falls prevention program as one of the sites for the STRIDE clinical trial, sponsored by the National Institutes of Health and the Patient-Centered Outcomes Research Institute. All Mount Sinai ambulatory practices are engaged in the effort. It involves identifying patients older than 75 who have fallen or are at risk for falling, conducting a patient evaluation, reviewing medications and making recommendations to try to prevent falls. The hospital offers many other programs aimed at improving care for the elderly. They include primary care for homebound patients, palliative care, and a dedicated, interdisciplinary geriatrics team for Coffey practice patients who are admitted.